Fairy's Frost Snow Making Kit - Creates 1 Gallon of Snow. 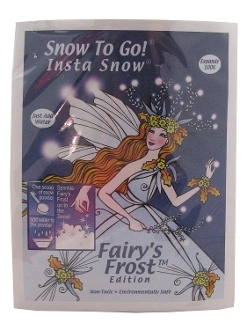 SNO-400FFED Fairy's Frost Edition Instant Snow To Go is a magical combination of our artificial snow with our Fairy's Frost glitter to create the impression of ice crystals flickering in the snow. You will love decorating with Snow To Go with Fairy's Frost, or making it at a party and watching the starburst effect from the combination of our snow powder and glitter. This stuff is incredible! To renew - just add a bit more water...Makes 1 Gallon of wonderful snow!